Describe the principles of a reservoir capacitor in basic power supplies. • The effect of a reservoir capacitor on the DC component. • The effect of a reservoir capacitor on the diode current. Describe the principles of a low pass filter used in basic power supplies. A typical power supply filter circuit can be best understood by dividing the circuit into two parts, the reservoir capacitor and the low pass filter. Each of these parts contributes to removing the remaining AC pulses, but in different ways. Fig. 1.2.1 shows an electrolytic capacitor used as a reservoir capacitor, so called because it acts as a temporary storage for the power supply output current. The rectifier diode supplies current to charge a reservoir capacitor on each cycle of the input wave. The reservoir capacitor is a large electrolytic, usually of several hundred or even a thousand or more microfarads, especially in mains frequency PSUs. This very large value of capacitance is required because the reservoir capacitor, when charged, must provide enough DC to maintain a steady PSU output in the absence of an input current; i.e. during the gaps between the positive half cycles when the rectifier is not conducting. The action of the reservoir capacitor on a half wave rectified sine wave is shown in Fig. 1.2.2. During each cycle, the rectifier anode AC voltage increases towards Vpk. At some point close to Vpk the anode voltage exceeds the cathode voltage, the rectifier conducts and a pulse of current flows, charging the reservoir capacitor to the value of Vpk. Once the input wave passes Vpk the rectifier anode falls below the capacitor voltage, the rectifier becomes reverse biased and conduction stops. The load circuit is now supplied by the reservoir capacitor alone (hence the need for a large capacitor). Of course, even though the reservoir capacitor has large value, it discharges as it supplies the load, and its voltage falls, but not by very much. At some point during the next cycle of the mains input, the rectifier input voltage rises above the voltage on the partly discharged capacitor and the reservoir is re-charged to the peak value Vpk again. The amount by which the reservoir capacitor discharges on each half cycle is determined by the current drawn by the load. The higher the load current, the more the discharge, but provided that the current drawn is not excessive, the amount of the AC present in the output is much reduced. Typically the peak-to-peak amplitude of the remaining AC (called ripple as the AC waves are now much reduced) would be no more than 10% of the DC output voltage. The DC output of the rectifier, without the reservoir capacitor, is either 0.637 Vpk for full wave rectifiers, or 0.317 Vpk for half wave. Adding the capacitor increases the DC level of the output wave to nearly the peak value of the input wave, as can be seen from Fig. 1.1.9. To obtain the least AC ripple and the highest DC level it would seem sensible to use the largest reservoir capacitor possible. There is a snag however. The capacitor supplies the load current for most of the time (when the diode is not conducting). This current partly discharges the capacitor, so all of the energy used by the load during most of the cycle must be made up in the very short remaining time during which the diode conducts in each cycle. The charge (Q) on a capacitor depends on the amount of current (I) flowing for a time (t). 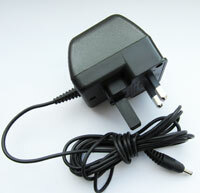 Therefore the shorter the charging time, the larger current the diode must supply to charge it. If the capacitor is very large, its voltage will hardly fall at all between charging pulses; this will produce a very small amount of ripple, but require very short pulses of much higher current to charge the reservoir capacitor. Both the input transformer and the rectifier diodes must be capable of supplying this current. This means using a higher current rating for the diodes and the transformer than would be necessary with a smaller reservoir capacitor. There is an advantage therefore in reducing the value of the reservoir capacitor, thereby allowing an increase in the ripple present, but this can be effectively removed by using a low pass filter and regulator stages between the reservoir capacitor and the load. This effect of increasing reservoir size on diode and transformer current should be born in mind during any servicing operations; replacing the reservoir capacitor with a larger value than in the original design "to reduce mains hum" may seem like a good idea, but could risk damaging the rectifier diode and/or the transformer. With full wave rectification the performance of the reservoir capacitor in removing AC ripple is significantly better than with half wave, for the same size of reservoir capacitor, the ripple is about half the amplitude of that in half wave supplies, because in full wave circuits, discharge periods are shorter with the reservoir capacitor being recharged at twice the frequency of the half wave design. Although a useable power supply can be made using only a reservoir capacitor to remove AC ripple, it is usually necessary to also include a low pass filter and/or a regulator stage after the reservoir capacitor to remove any remaining AC ripple and improve the stabilisation of the DC output voltage under variable load conditions. Either LC or RC low pass filters can be used to remove the ripple remaining after the reservoir capacitor. The LC filter shown in Fig. 1.2.3 is more efficient and gives better results than the RC filter shown in Fig. 1.2.4 but for basic power supplies, LC designs are less popular than RC, as the inductors needed for the filter to work efficiently at 50 to 120Hz need to be large and expensive laminated or toroidal core types. However modern designs using switch mode supplies, where any AC ripple is at much higher frequencies, much smaller ferrite core inductors can be used. The low pass filter passes low frequency, in this case DC (0Hz) and blocks higher frequencies, whether 50Hz or 120Hz in basic circuits or tens of kHz in switch mode designs. The reactance(XC) of the capacitor in the either of the filters is very low compared with the resistance of resistor R or the reactance of the choke XL at the ripple frequency. In RC designs the resistance of R must be a fairly low value as the entire load current, maybe several amperes, must pass through it, generating a considerable amount of heat. A typical value would therefore be 50 ohms or less, and even at this value, a large wire wound resistor would normally need to be used. This limits the efficiency of the filter as the ratio between the resistance of R and the capacitor reactance will not be greater than about 25:1. This then would be the typical reduction ratio of the ripple amplitude. By including the low pass filter some voltage is lost across the resistor, but this disadvantage is offset by the better ripple performance than by using the reservoir capacitor alone. The LC filter performs much better than the RC filter because it is possible to make the ratio between XC and XL much bigger than the ratio between XC and R. Typically the ratio in a LC filter could be 1:4000 giving much better ripple rejection than the RC filter. Also, since the DC resistance of the inductor in the LC filter is much less than the resistance of R in the RC filter, the problem of heat being generated by the large DC current is very much reduced in LC filters. With a combined reservoir capacitor and low pass filter it is possible to remove 95% or more of the AC ripple and obtain an output voltage of about the peak voltage of the input wave. A simple power supply consisting of only transformer, rectifier, reservoir and low pass filter however, does have some drawbacks. a. The reservoir capacitor being discharged more on each cycle. b. Greater voltage drop across the resistor or choke in the low pass filter as current increases. These problems can be largely overcome by including a regulator stage at the power supply output as described in Power Supplies Module 2. The basic power supply circuits described here in Module 1 however, are commonly used in the common ‘wall wart’ type DC adaptors supplied with many electronics products. The most common versions comprise a transformer, bridge rectifier and sometimes a reservoir capacitor. Additional filtering and regulation/stabilisation being usually performed in the circuit supplied by the adaptor.